Enjoy a screening of the classic '80s flick. 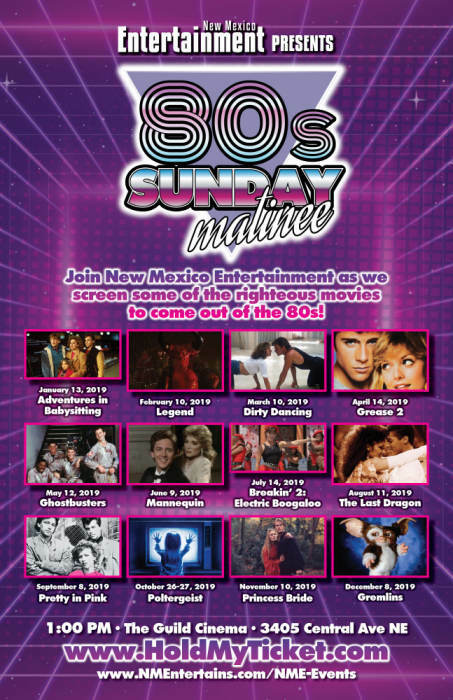 Join New Mexico Entertainment magazine for our monthly 80's movie screening at The Guild Cinema. This month's movie is Grease 2. An English student at a 1960s American high school has to prove himself to the leader of a girls' gang whose members can only date greasers. MOVIEPASS IS NOT ACCEPTED AT NEW MEXICO ENTERTAINMENT MOVIE NIGHTS. PLEASE NOTE: TICKETS WILL NOT BE MAILED TO YOU. Please bring your Hold My Ticket receipt with your current state ID and check in at the Guild Box Office 15 minutes before the show. If you do not have your receipt, please make sure if you have your ID. We will have a list at the box office. In the likelihood we have a sold-out performance or event, tickets are subject to be released for resale to those on the waiting list if you have not checked five minutes before the show starts. Thank you for your punctuality!